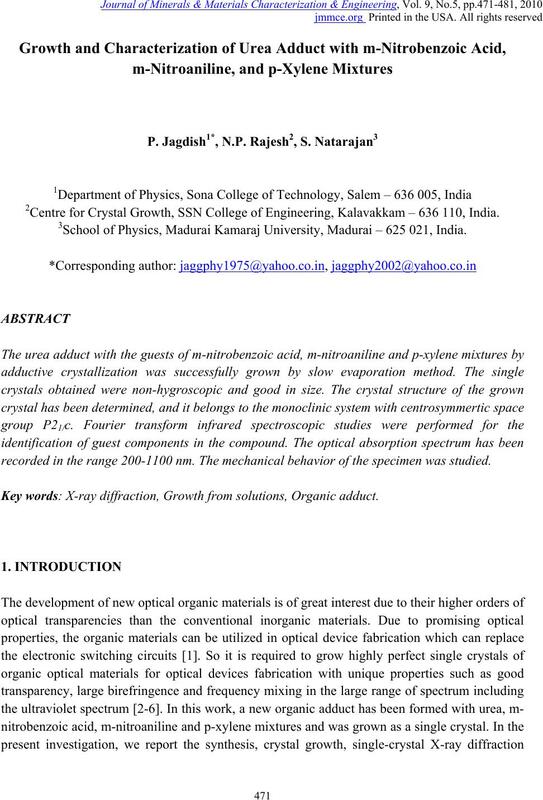 2Centre for Crystal Growth, SSN College of Engineering, Kalavakkam – 636 110, India. 3School of Physics, Madurai Kamaraj University, Madurai – 625 021, India. recorded in the range 200-1100 nm. The mechanical behavior of the specimen was studied. 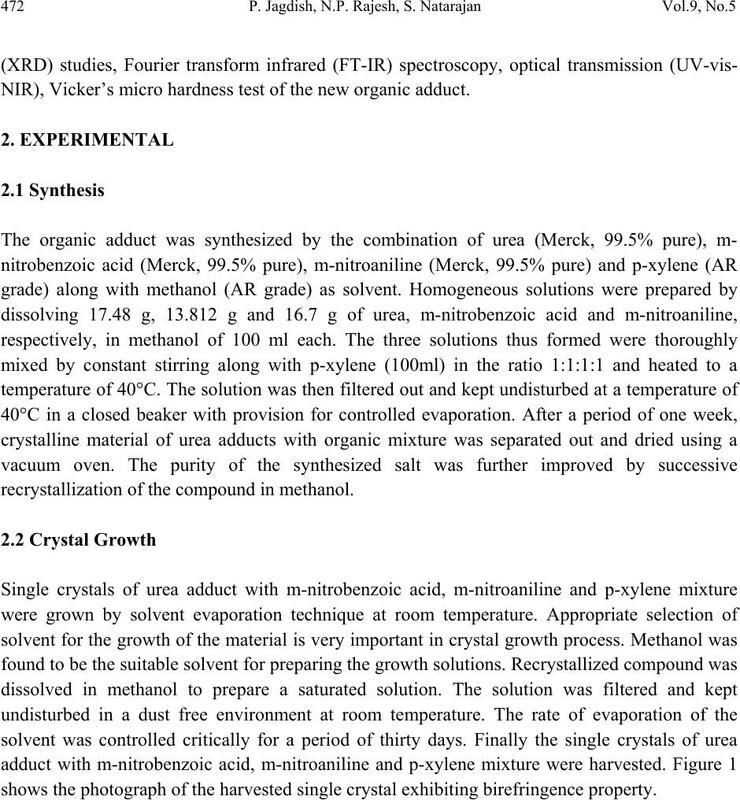 Key words: X-ray diffraction, Growth from solutions, Organic adduct. NIR), Vicker’s micro hardness test of the new organic adduct. recrystallization of the compound in methanol. 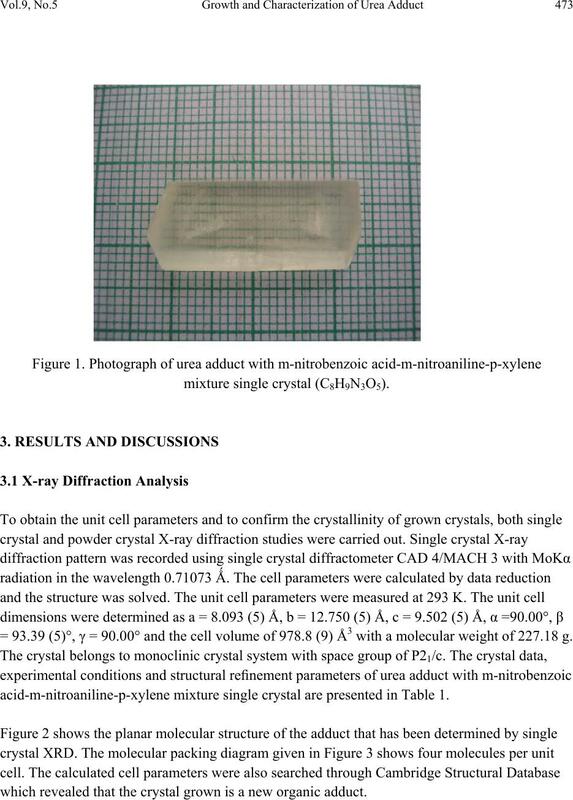 shows the photograph of the harvested single crystal exhibiting birefringence property. 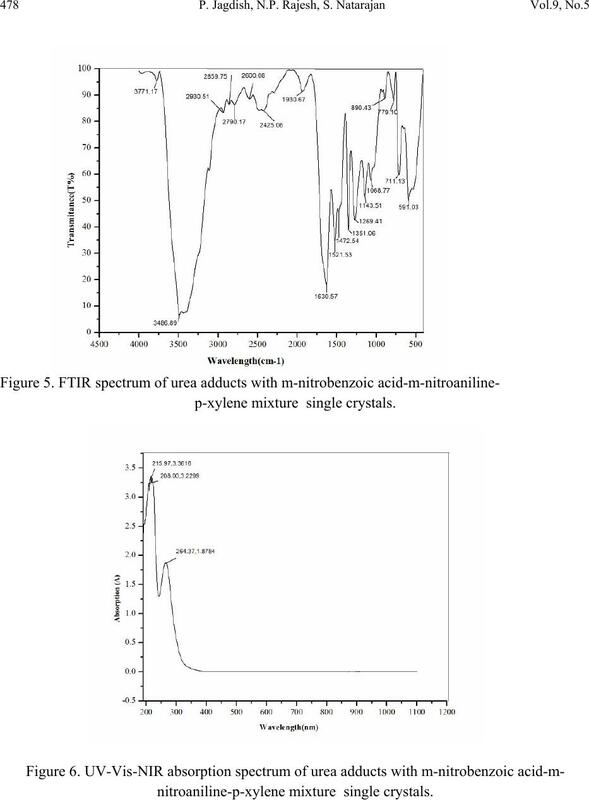 = 93.39 (5)°, γ = 90.00° and the cell volume of 978.8 (9) Å3 with a molecular weight of 227.18 g.
acid-m-nitroaniline-p-xylene mixture single crystal are presented in Table 1.
which revealed that the crystal grown is a new organic adduct. nitroaniline-p-xylene mixture single crystal (C8H9N3O5). Figure 2. The molecular diagram of C8H9N3O5 with numbering scheme. Figure 3. 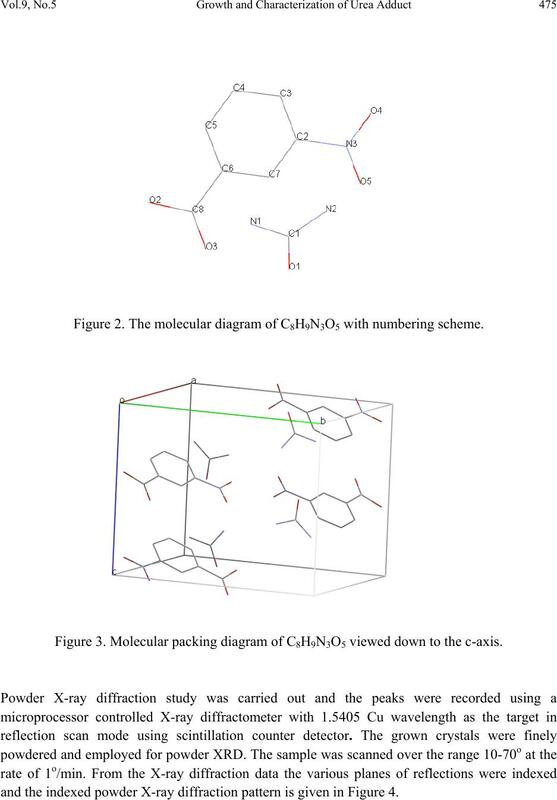 Molecular packing diagram of C8H9N3O5 viewed down to the c-axis. 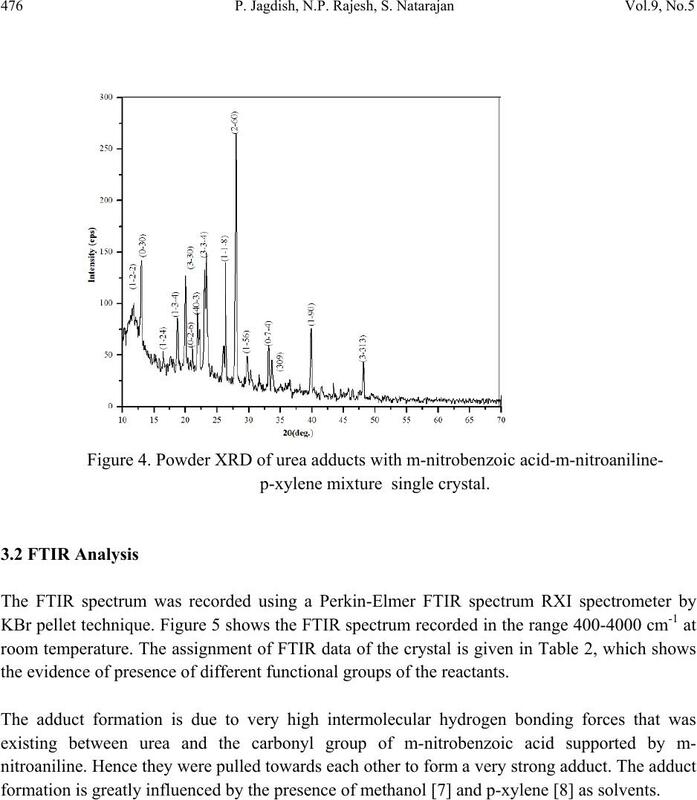 and the indexed powder X-ray diffraction pattern is given in Figure 4.
the evidence of presence of different functional groups of the reactants. formation is greatly influenced by the presence of methanol  and p-xylene  as solvents. 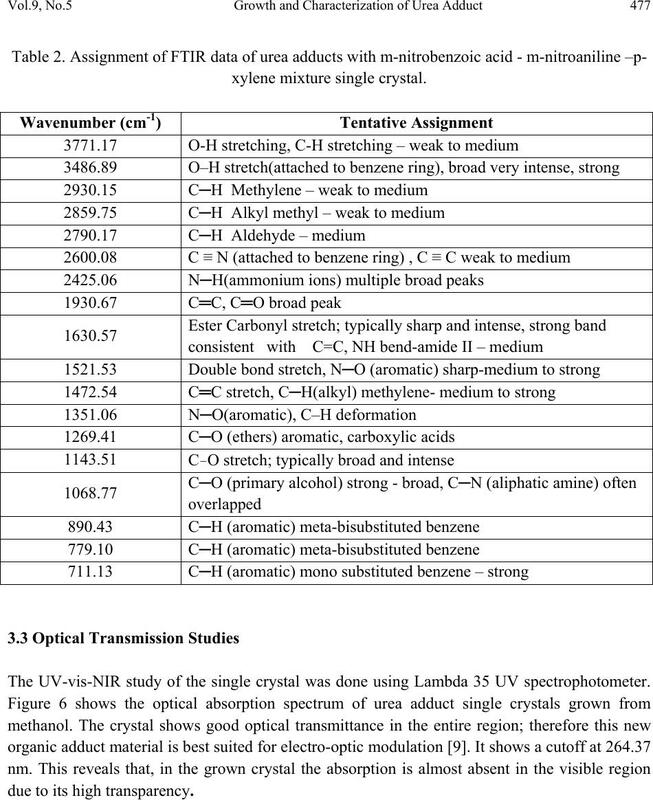 The UV-vis-NIR study of the single crystal was done using Lambda 35 UV spectrophotometer. due to its high transparency. load and d is the diagonal length of the indentation impression. shows the variation of microhardness number (HV) as a function of applied load (P). Figure 7. 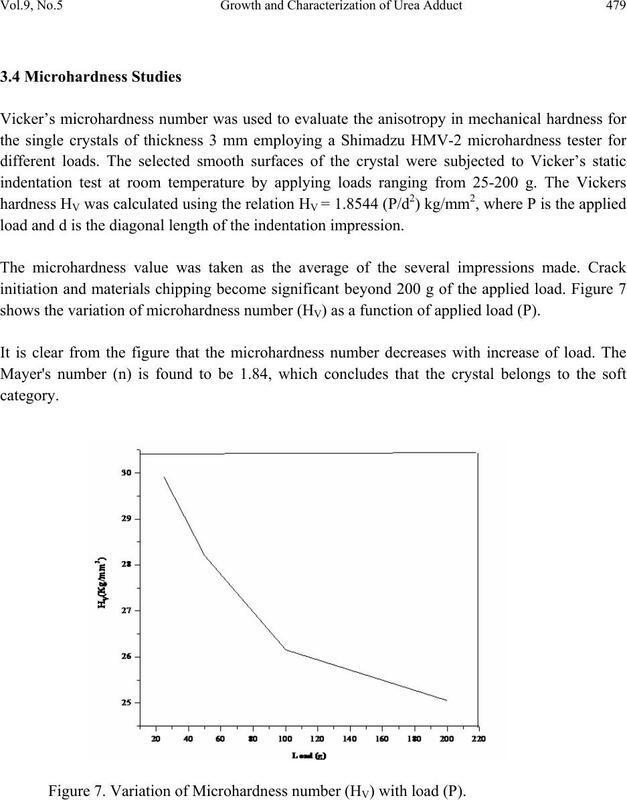 Variation of Microhardness number (HV) with load (P). and grown as single crystal by slow evaporation solution growth technique at room temperature. centrosymmetric space group P21/c. The molecular packing shows four molecules per unit cell. 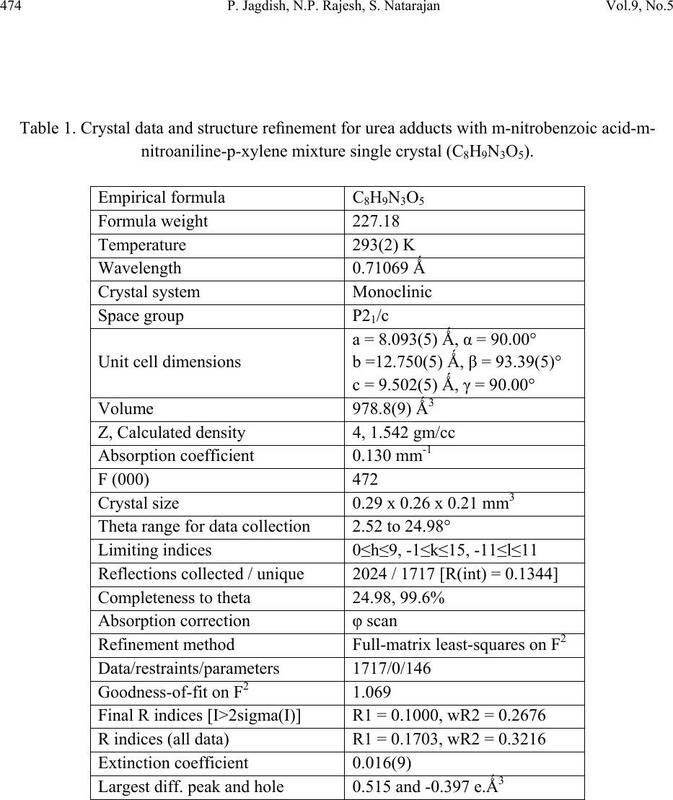 microhardness studies concludes the category of the organic adduct crystal as soft category. to carry out this research work. Crystal Structure of Ls-Threonine.” J. Am. Chem. Soc. Vol. 72(6), pp. 2328-2349. R.T. Denton, F.S. Chen, A.A. Ballman, 1967, “Lithium Tantalate Light Modulators” J.
Appl. Phys. Vol. 38, pp. 1611-1617.
parametric oscillator pumped by XeCl excimer laser” Optical Lett. Vol. 14, pp. 560-562.
uncut crystals of organic nonlinear optical materials.” Philos. Msg. Lett. Vol. 62, pp. 1-7. Joseph Zyss, 1982, “New organic molecular materials for nonlinear optics,” J. Non. 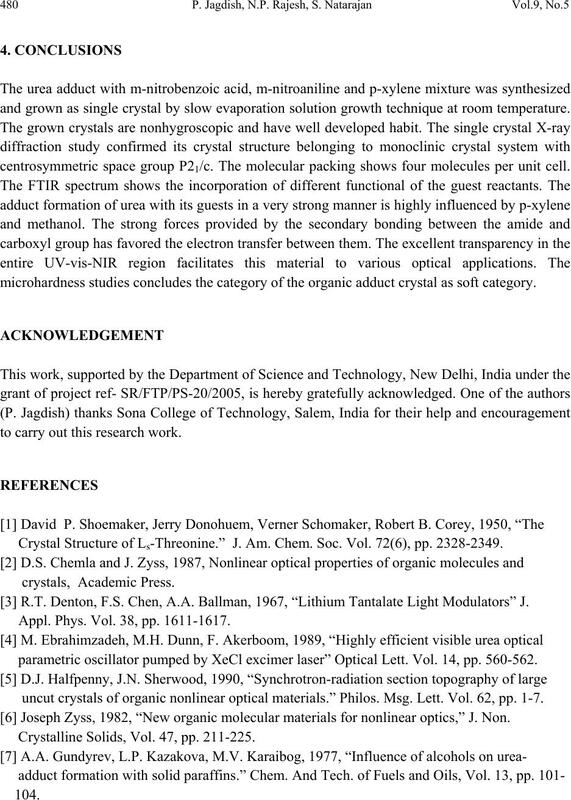 Crystalline Solids, Vol. 47, pp. 211-225. Xylene. Exchange and Rearomatization of p-Xylene Adducts.” Can. J. Chem. Vol. 52, pp. Aldehyde.” Phys. Chem. Sol. Vol. 64, pp. 147-153.